I love The Common! I don’t go as much as I should for the amount of good times I have there, but that really needs to change. The Common just announced their new Three for Thirty – 3 courses for $30 feature happening every Tuesday night, so in the never ending quest to have awesome but affordable meals out, that shoots right up high on the list! They’re also pretty well-known for the fun pop-up dinners they host! 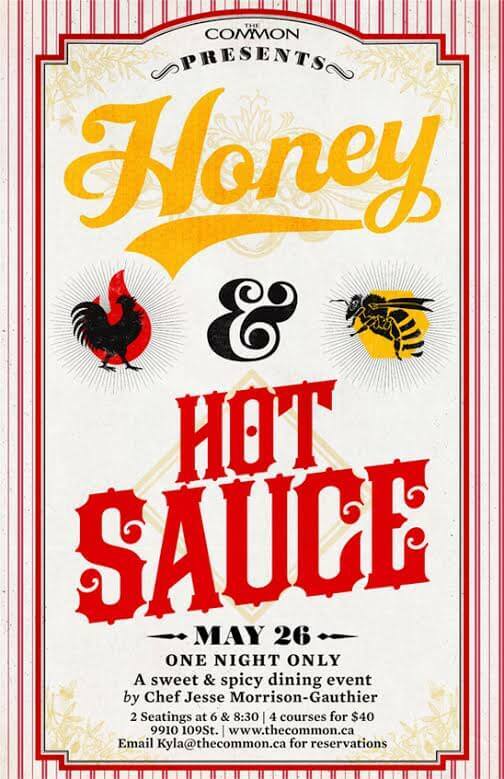 The latest one – The Common Presents: Honey & Hot Sauce – takes place this Tuesday, May 26, 6 p.m. or 8:30 p.m. seatings! It will be a spicy & sweet dining event with a fun, delicious sounding (and sure to be delicious tasting) menu from Chef Jesse Morrison-Gauthier! The Common presents: Honey & Hot Sauce! I’ve unfortunately got a work event I need to attend that same night (just the worst timing) so I’m sad I can’t go to Honey & Hot Sauce, but the lovely folks over at The Common are letting me give away a pair of tickets to one of you lovely readers so you can go and enjoy in my place! If you’re not sure about your chances, you should just book anyway! They’ve got a couple of spots left for 6 p.m. and 8:30 p.m. You can email kyla@thecommon.ca or call 780-452-7333 to make your reservation! And RSVP on their Facebook Page here! Leave a comment on this blog post letting me know which Honey & Hot Sauce menu item you’re most excited to try. I will randomly draw a winning entry from all entries after the contest closes on Sunday, May 24, 2015. Please note comments need to be moderated so if you don’t see your comment appear right away, don’t worry! The wings n things sounds nice, because it includes sweetbreads and rabbit! Chili chocolate doughnuts! This sounds too good to be true. Hello! Those doughnuts…mmm…or the lamb popsicles…yum!! Omg, I need those wings n things in my belly! Also, follow The Common on Twitter, you on IG and liked The Common on FB!